We have the photoreceptor cells, called cones, in the retina of the eyes. 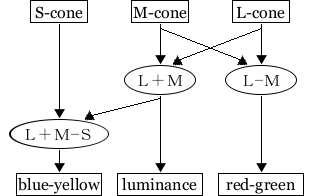 The cones are classified into three types: L-cone, M-cone, and S-cone. 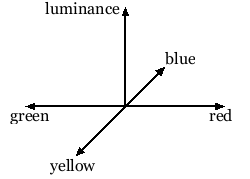 It is based on their spectral sensitivity as shown below. These are 2-deg cone fundamentals, note that the upper spectrum image is shown only as a guide. 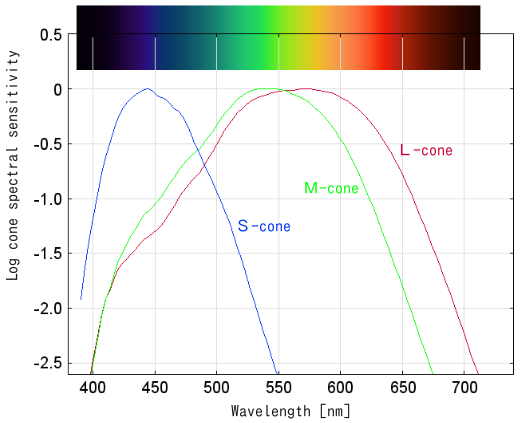 The figure shows each cone is stimulated in the degrees varied by the wavelength of the light even if it is the same energy. And each cone emits signals according to the stimulus. By the other cells, such as bipolar cell, horizontal cell, the signals sent from the cones are calculated as follows. The three channel signals, the results of those calculation, are transmitted to the brain and perceived as color. The space composed by those three sensations is called "opponent color space." As mentioned above, the sensations of opponent color space calculated from the three cone signals are transmitted to the brain. This mechanism is called "stage theory" and it is considered to be the most widely held theory of color vision.